CORRECTION TO THIS ARTICLE: The Oct. 7 version of this article misspelled the name of the reporter. She is Kirtana Raja, not Kirtina Raja. A childhood filled with explosions and dangerous chemicals might sound like a recipe for disaster, but it led Professor Richard R. Schrock to pursue a career in chemistry that reached a high point Wednesday when he was named recipient of the Nobel Prize in Chemistry. 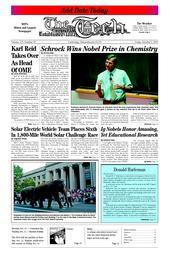 The announcement makes Schrock the fourth MIT science professor to win a Nobel Prize since 2001. Schrock said the call from the Nobel Committee at 5:30 a.m. was a surprise. “You don’t expect these things. Winning the Nobel Prize is a privilege and not a right,” he said. When Schrock called his 92-year-old mother to tell her the news, “She said, ‘You won a what?’” because “she’s a little hard of hearing. Then I yelled into the phone: ‘Nobel Prize! You’ve heard of that,’ and she started screaming. I think she got the point,” Schrock said. According to Schrock’s wife, Nancy F. Carlson, the couple was physically shaking after hearing the news. “I called my son in California and woke him up and then called my other son in Florida and woke him up to let them know that their father had won,” she said. Schrock discussed his prize-winning research at a press conference held Wednesday morning and a packed Nobel lecture in 10-250 that afternoon. In his lecture, Schrock first acknowledged his family, colleagues, and students, giving his wife special acknowledgement. “She got me when my stock was real cheap … I was not an obvious Nobel candidate,” Schrock said. The new laureate said that he first became interested in chemistry at age eight when his older brother gave him a chemistry set. Schrock recalled the explosions associated with his childhood experiments involving nitroglycerine and sodium. “You could move atoms. You could be God. That really turned me on,” he said. In metathesis reactions, special organometallic catalysts are used to allow atoms to switch places and form new compounds. When carried out under the correct conditions with the appropriate catalysts, metathesis reactions are fast and environmentally friendly, making them ideal processes for the chemical industry. Although scientists knew of these metathesis reactions and could carry them out by the 1950s, “what they were, was not well known,” Schrock said. In 1971, Chauvin proposed a mechanism, and from that seminal work, Schrock experimented with catalysts while working at Du Pont. After studying metals such as tantalum, molybdenum and tungsten for potential roles in metathesis, he succeeded in developing a stable molybdenum-based catalyst in 1990. Grubbs later improved upon Schrock’s work by coming up with an even faster and more effective ruthenium-based catalyst. The metathesis process can be used to break down readily available cyclic carbon molecules with double bonds to produce polymer chains with a variety of uses. Schrock said that the metathesis reaction has been important to the advancement of the polymer field. At the end of his Nobel lecture, Schrock said that he had no idea that the initial results of the “basic research” he did at Du Pont would eventually lead to the Nobel Prize. “At the time, I was just happy to have a job and a wife who loved me,” he said. Schrock earned his bachelor’s degree in 1967 from the University of California at Riverside and PhD degree from Harvard University in 1971. After one year as a National Science Foundation postdoctoral fellow at Cambridge University and three at Du Pont, he joined MIT in 1975. —Kelley Rivoire contributed to the reporting of this story.